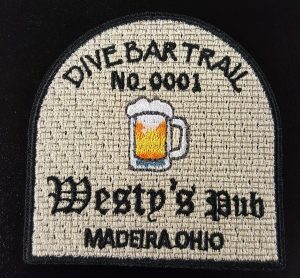 Westy’s Pub in Madeira Ohio has signed up for the Dive Bart Trail Free Patch promotion. The program is designed to offer registered users of Dive Bar Trail a chance to collect patches from their favorite Dive Bars. Registered Dive Bar Trail Users can visit Westy’s and take advantage of the free offer by simply patronize the bar and ask for your free patch. Limit one per customer, qualifying purchase applies. Its 100% stitched custom patch that can be sewn or ironed on. Stay tune to Dive Bare Trail for more locations coming soon. Please stop by and join Karen, Mindy, Julie and JP at Westy’s Pub for great food and drink .